Going through airport security isn’t our favorite part of air travel—that’s reserved for the guilt-free movie watching time—but at least it’s a predictable process most of the time. Add a pet to the equation, though, and it takes a bit of extra planning to create a good experience for everyone! 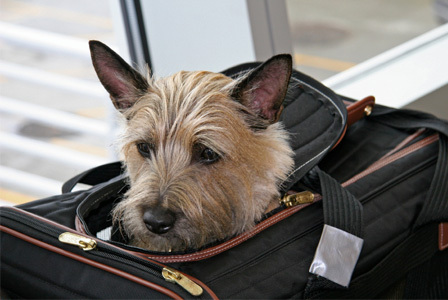 If you and your dog are heading on your first in-cabin airplane flight together, you’ll both be going through the security screening process. Since you can’t just watch the person in front of you to see how the pet-screening process happens, we’ve gathered some helpful questions and answers to keep the process smooth and simple. What should I do when I get to the security screening station? Start off with your usual human routine—remove all metal, empty your pockets, and put all of your belongings in the screening bins. Then it’s time to prep your pup. Place the carrier on the screening table and take your dog out of the carrier. You’ll need to carry her through the metal detector with you while the carrier goes through the x-ray scanner. Aside from a travel carrier that meets your airline’s requirements and fits comfortably under the seats, we’ve found that it’s helpful to bring a fabric leash, a fabric collar or harness, and plastic ID tags for your pup. The leash, collar, and tags should go through the metal detector with the carrier when you go through security. But you’ll want them on hand when you de-board and take the dog to do her business, and don’t forget dog pick-up bags for those occasions. In most cases, you’ll also need a health certificate and a proof of rabies vaccine from your vet (check with your airline for airline-specific and destination-specific requirements). Will my dog ever go through the scanners? Nope! If you’re going through a metal detector, your pup will go with you, but they’ll never be put through the x-ray scanner. If you’re at an airport with the full-body scanners, you will be directed to go through a regular metal detector or can opt for a manual inspection. My dog gets nervous in new situations. I don’t feel comfortable taking him out of the crate in a public place—any suggestions? smaller, quieter area for a manual scan, which can help calm down any excitable or nervous pups. Is this process the same at all airports? In our experience, this process will be the same for flights leaving from airports in the US, Canada, and most of Europe. The only thing that might be different? The security requirements when you land in a new country. Some destinations, such as Australia, will have special requirements and quarantine periods for international pets while other countries (like Italy) will probably just wave you through security with a nod. For information on pet travel requirements for international destinations, check the embassy website for the country you wish to visit. Have you had similar experiences making it safely through security with your four-legged friend? Share your tips and tricks for dog-friendly security screening in the EzyDog comments!